The following article appears in the March 2014 edition of the The Historical Bulletin of the Brown County Historical Society, and is one in a series of articles on Brown County's historical markers placed in the early 1900s. It happened recently, while driving south on Ashland Avenue, a route I’ve taken many times before. But this time a sparkle was captured in the periphery of my vision as I sped past a small park. A quick U-turn and I was headed back towards downtown Green Bay in search of treasure – a once purposefully placed and now generally overlooked historical marker. To my delight, I was rewarded for my efforts by the discovery of a bronze marker mounted onto a pink granite boulder. 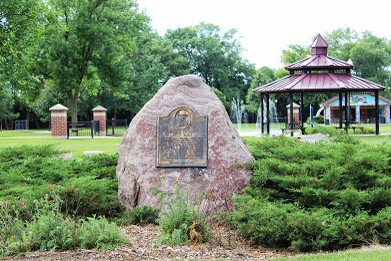 The Green Bay and Western Railway forms the boundary west and south of this park. It was this railway which Frank B. Seymour served for 64 years, rising from water boy to president in his long and unusual career. He brought distinction to his industry and his city. He provided the leadership in the move to convert an unsightly slough into this useful public property and contributed substantially to the improvement. It tried to imagine the now impeccably-manicured, gazeboed park as an “unsightly slough,” and thought about Seymour’s rise from water boy to president. That’s the real magic of an historical marker -- the opportunity to see into the past to the people and their stories, to events and their outcomes, and to be reminded that the Green Bay I toodle around in today is very different from a hundred or a thousand years ago and more. I also considered the history of the marker itself. Who placed it there? Who designed it? Was it expensive? Where did that boulder come from? I searched for Frank B. Seymour online and found nothing. Then I tired The Green Bay and Western Railway and quickly located The Green Bay and Western Historical Society, Inc. A few e-mail exchanges with GBWHS Editor and Webmaster Bill Christopher, and voilà, I had much of what I was looking for. In his book The Green Bay and Western: From Moguls to Alcos, author Stan Mailer describes the unveiling of the marker. On July 16, 1936, over 200 people, many of them employees of The Green Bay and Western Railway, gathered at the slough-of-brackish-waters-turned-park to honor their retired president, Frank B. Seymour. “FBS”, as he was affectionately referred to, had donated the materials. WPA workers had donated their labor and time. Identified as “the grand old man from New London”, FBS was present as his great-granddaughter, Miss Janet Zahorik, unveiled the bronze tablet honoring his distinguished GB&W career. Afterwards, FBS expressed his gratitude. Then mayor, John V. Diener, and other dignitaries spoke to the coming of diesel trains and other large-scale changes to the GB&W. It was a day of pomp, circumstance and celebration. Sadly, FBS would not live to see the anticipated changes. He passed away on May 6, 1938, before the first diesel train arrived in Green Bay. 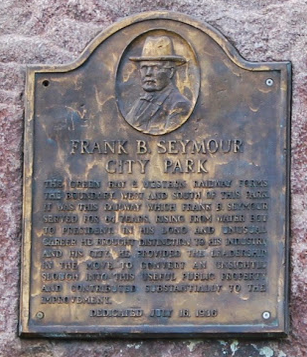 And that’s how the lovely community park on South Ashland Avenue, between School Place and Clinton Street came to be, and how the legacy of Frank B. Seymour was literally preserved in stone. There are about a dozen bronze markers peppered throughout Brown County – erected between 1899 and 1934, their significance and stories all but forgotten by this current generation. This article marks the launch of a new series in the BCHS Newsletter. Future issues will identify one of Brown County’s bronze beauties, provide the marker’s location and report the history behind its placement. After all, we’re those future generations these markers were created for! It’s time to bring these stories back to life and to honor the legacies thoughtfully preserved in bronze – to take a moment to consider Brown County’s rich, interesting history and to remind ourselves that there wasn’t always a Kwik Trip on every other corner.